This may seem like a Yogi Berra-like truism, but for me it reveals an important distinction. The latter goal I would call “necessary,” while the former I would call “convergent.” It’s the goal of all Major League baseball teams to get to, and win, the World Series. This is why I call this goal necessary; it is part of their very identities. Without such a goal, they wouldn’t be in the Big Show to begin with. On the other hand, the Yankees could have gone to the World Series and not prevented the Red Sox from doing so had the Sox simply not made it as far in the post-season as they did. So keeping the Sox out of the Series was a goal that just happened to converge with the Yanks’ necessary one at the right time. I’m sure we’re all aware of what happened, even though the response on the Alt Right has been fairly muted. In late December 2016, the UN Security Council voted unanimously  to adopt a resolution which condemned the construction of Israeli settlements in the West Bank. Essentially, the UN called such settlements illegal. In the past, the United States would have vetoed such a resolution, but this time it abstained. This basically left Israel hanging like a circumcised scarecrow in the desert wind. A furious Bibi Netanyahu decried the resolution  and promised defiance, but there was little else he could do. It’s understandable that many on the Alt Right would have mixed meme-motions over this. On one hand, the Obama White House and the UN consist of exactly the kind of Left-wing globalist elites who are the enemies of white identity and white ethnonationalism. They truly hate us and would never do us any favors. So we are, of course, loath to clap them on the back for anything. On the other hand, the people getting the short end of the shtick in this scenario are the Jews, or, really, the Israelis. Given the intensity of feeling against Jews and Israel by many on the Alt Right, such a turn of events may be viewed by some as a good thing. There is also the sweet schadenfreude that I’m sure many of us feel towards the 70-80 percent of American Jews who were on board with Obama from day one and who are now gnashing their teeth at this brazen betrayal. Beyond this, however, this issue probably would not have had any lasting traction, given that these UN resolutions are fairly toothless by nature. But the Cruz-Graham bill changes that. The bill potentially gives this issue some unintended permanence, and could turn it into a historic moment for White Nationalism. Slim odds, I know, but still better than zero, which were what the odds were as little as a month ago. The concept of defunding the UN is not without precedent, of course. In 2015, Congressman Mike Rogers of Alabama introduced a bill  not only to defund the UN, but for the United States to completely withdraw from it. Further, with all the UN’s crimes , scandals , corruption , and meddling  in US affairs, not to mention its annual $8 billion price tag  (22 percent of its budget and far more than what any other country contributes), people have been talking about defunding it for a long time now. With this new bill being drafted by two high-profile and influential senators (along with a similar bill  being drafted in the House of Representatives by Republican Louie Gohmert), the defund-the-UN train has finally gotten going. Of course, there are a couple ways of looking at this. A cynic would say that cuckservatives like Cruz and Graham have no real intention of doing something as drastic as defunding the UN, and wish nothing more than to virtue-signal their philo-Semitism and play coy for their liberal masters in the mainstream media and the Democratic Party. On the other hand, a more optimistic perspective would suggest that Ted Cruz – who is the prime mover behind the bill and is more genuinely Right-wing than many of us realize – has always wanted to defund the globalist beast, and has now found an opportunity to do just that. Perhaps the truth lies somewhere between these extremes. How far will this go? Who knows? Far, hopefully. 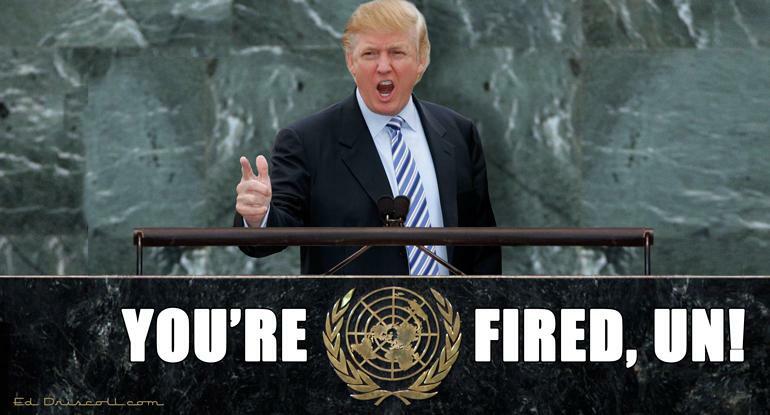 In the best-case scenario, President Trump (who has signaled that he is no fan of the UN) gets the bill passed and signed, and then the UN will not only be defunded but defanged. This, of course, would be a Good Thing, and I am sure that everyone on the Alt Right would agree. At the very least, the Cruz-Graham bill will have more people taking this issue seriously than ever before. Notice, however, that, in the odd confluence of current events, anti-Semites and philo-Semites will both have a reason to celebrate this. Isn’t that a little weird? Since when do these two groups find something to agree upon in the realm of politics? Of course, this interesting and coincidental accord will last only in the event that the bill passes and the UN does not change its tune regarding Israel. If it does, then we fall back into the sticky globalist web, and nobody wins except Israel. But if it doesn’t, then everyone except Israel gets what they want. The mainstream GOP gets to please their Zionist donors, and the Alt Right will see America inch closer to the possibility of a white ethnostate. Since Israel will likely not be seriously harmed by this resolution to begin with, this is probably the best possible outcome. This leads back to my original point about necessary versus convergent goals. From a white nationalist perspective, quitting the UN must happen. No white ethnostate can belong to the current United Nations – Marxist, globalist, integrationist entity that it is. Therefore, quitting it is a necessary goal. In comparison, railing against Israel or Jews in general are convergent goals. Yes, Israel receives far too much from the United States in terms of aid and wields too much influence over our affairs. Yes, organized liberal Jewry is doing everything it can to erode Western culture and wipe out white majorities in Europe and America. And yes, reversing both of these would be great accomplishments and do much to bring about a white ethnostate. But the Cruz-Graham bill shows that philo-Semitic actions can help to achieve this as well. Look at it this way: if giving Israel a hard time were a necessary goal of white nationalism, then white nationalists would oppose the Cruz-Graham bill and support America’s subsidizing of the UN, which constantly issues nasty resolutions against Israel. But they don’t, nor should they. I think we should always distinguish between what is necessary for white nationalism and what is merely convergent. Certainly, necessity means excluding Jews in general from a white ethnostate – but that’s not the same as hostility toward Jews and Israel, which is a convergent goal as long as Jews and Israel play the Red Sox to our Yankees and resist us in our necessary goals. Furthermore, we wish to exclude all non-whites in general from a white ethnostate. Why single out Jews when we feel the exact same way about blacks, Hispanics, Arabs, and Asians? Israel excludes outsiders from immigrating to their nation, just as do Japan, South Korea, and other ethnostates. Does this necessarily imply hostility against outsiders? Not at all. So, yes, we should be hostile to those Jews and other groups who resist us in our necessary goals. But we should also be respectful to those Jews  who don’t . But neither this hostility nor this respect should be mistaken for the goal itself. Only by keeping our focus on our necessary goals and knowing how to distinguish them from our convergent goals will we gain the greatest number of allies and the fewest possible enemies in our struggles. And then, perhaps, we will make it to the World Series after all.